The Webster Hardness Tester is a portable, fast, accurate hardness gauge that is made in three distinct models for testing aluminum, brass, copper, and mild steel. The Webster Hardness Tester will quickly identify tempers and test a variety of shapes that other testers cannot check, such as extrusions, tubing, and flat stock. Each tester model operates in the same manner but differs only in penetrator design, type of load spring, and hardness ranges. The principle of operation is simple. The work to be tested is placed between the anvil and the penetrator. Pressure is then applied to the handles until the "bottom" is felt at which time the dial indicator is read. The Model B Tester is designed to cover the hardness of aluminum alloys from the 100 to the 7075 series. The 20 graduations on the Webster dial indicator covers the range between 25 and 110 on the Rockwell E Scale. 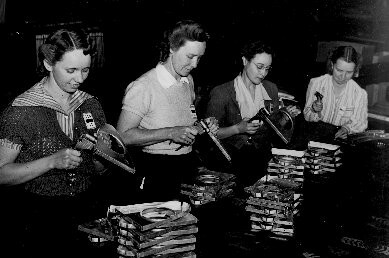 The Model B-75 Tester was developed to obtain a more sensitive response to slight changes in the upper range of hardness covered by the Model B. 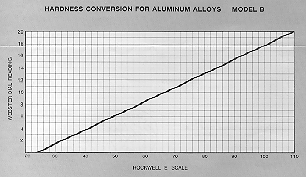 This sensitivity is particularly useful in testing mild steel and the stronger aluminum alloys. 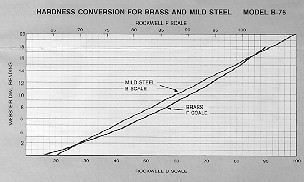 For brass, the B-75 covers the range from annealed to full-hard. This added sensitivity is accomplished by incorporating a penetrator of slightly different contour and a heavier load spring than used in the Model B. The 20 graduations on the Webster dial indicator covers the range between 20 and 100 on the Rockwell B Scale. The Model BB-75 Tester was developed to answer the need of certain industries for a method of rapidly testing the hardness of electro-deposited copper in the low hardness range. The B-75 penetrator is used to give sensitivity, and the Model B load spring is employed to give light pressures. This combination allows the user to test the soft range of many common materials. 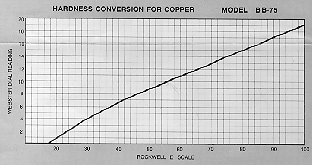 The graph below shows the range covered by the Model BB-75 tester on copper. In addition to our hardness tester, we also offer test strips. These are specially designed to determine if an instrument, such as the Webster Hardness Tester, is calibrated correctly.